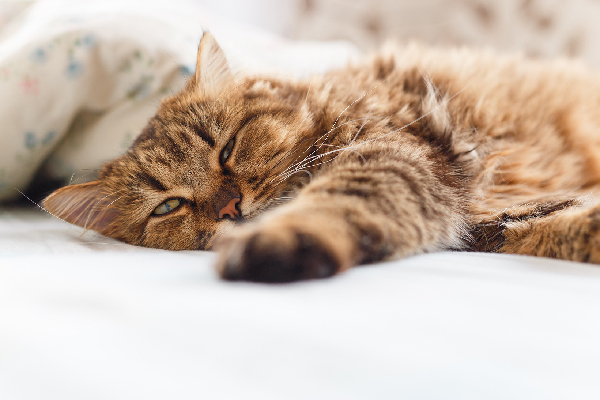 Do You Have an Aggressive Cat — or Just a Brat?! 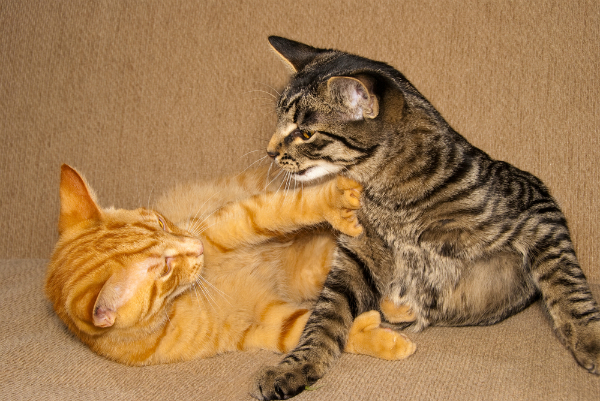 We help determine if you have an aggressive cat or just a bratty kitty who wants all of your attention. There they go again! BooBoo is chasing Miss Gigi around the house. Gigi is yelling at him and hissing as she runs, with BooBoo close behind. When he finally catches up with her — and he always does — BooBoo stands over Gigi, who by now has flipped over onto her back with her four paws in the air, claws extended, warning him not to make another move. And he doesn’t. He’s accomplished what he set out to do and has moved on to his next adventure. Later that same day, I’m on the phone with a new client, when in saunters BooBoo. After he unsuccessfully tries to hang up the phone and pull the receiver from my ear, BooBoo quietly walks over to the corner of my office and stands there, waiting until I glance over. Then, slowly, his tail goes up, he looks me directly in the eye and … yes. He sprays. Later that night when we’re in bed, BooBoo decides he wants to lie on top of my head. I attempt to move him off and over to my side. BooBoo has exceptionally strong paws, and he uses them like hands to grab and firmly hold whatever he wants. BooBoo grabs my hand between his paws, forcefully pulls my fingers to his mouth and bites. I know, I know. Reading this, you’re probably amazed that such things occur in my household. But being a cat behaviorist doesn’t mean I never have a problem with my own cats. These things don’t happen with BooBoo anymore — at least, not with regularity. But I had to take the time to understand just what was going on here. At first glance, it makes sense to conclude that BooBoo is just an aggressive cat. He is, in fact, not an aggressive cat at all. If he were, he and Gigi would have fought tooth and nail. What BooBoo really is a brat cat! Do you have an aggressive cat? Is the cat friendly with other cats and/or dogs in the household? Has the cat attacked a person, another cat, dog or other household pet? When he’s chasing another cat or nipping a person’s fingers, does he hiss and growl and lash out with anger? In BooBoo’s case, the answers to these questions were: yes, yes, no and no. BooBoo is always eager to meet human visitors and loves to be the center of attention for head rubs and playtime. As for the other cats in our household, BooBoo loves them. When we took in “The Quads” at 7 weeks of age a few years back, BooBoo (remember, he’s a boy!) “nursed” them, cuddled them and gave them all baths, just like he was their momma. BooBoo generally pals around with all the cats, but he’s also our alpha cat, so every now and then he feels the need to remind them. I believe this is what makes him chase mild-mannered little Gigi; he knows she’ll run, so not only is it a sport for him, but it lets the others see who’s the boss! He has never bitten, scratched, hissed or growled at another cat or human. Therefore, I conclude that he’s a non-aggressive kitty brat. Now you’re probably nodding your head with the realization that you have a brat, too. So, what do you do with this information? Bratty cats tend to be the smart ones — the ones who need a lot of mental, physical and emotional stimulation. Another part of why they may chase their cat friends is out of boredom. In nature, cats spend a great deal of their time hunting for food, but our spoiled indoor kitties don’t need to do that. What to do with all that pent-up energy? Get into things and start trouble, of course. Brat cats also tend to need a lot of attention from their humans, and they love interactive playtime with feather toys, fishing pole-type toys and things they can chase. 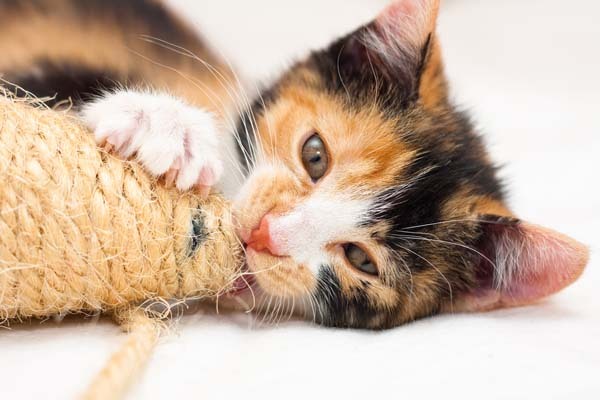 Give your high-energy cat plenty of active self-play cat toys, too, like food puzzles and toys with moving parts. 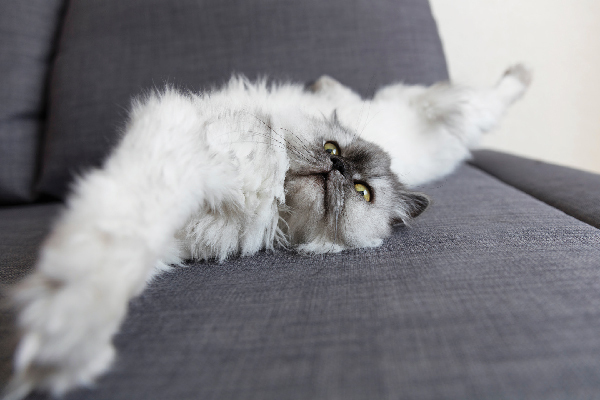 Does doing all this ensure that your cat will stop being a brat? Probably not entirely. But, Gigi is a lot more relaxed now that I know what to do to keep BooBoo from getting bored. Keep your running shoes laced up though, Gigi — you still might need them every once in a while. 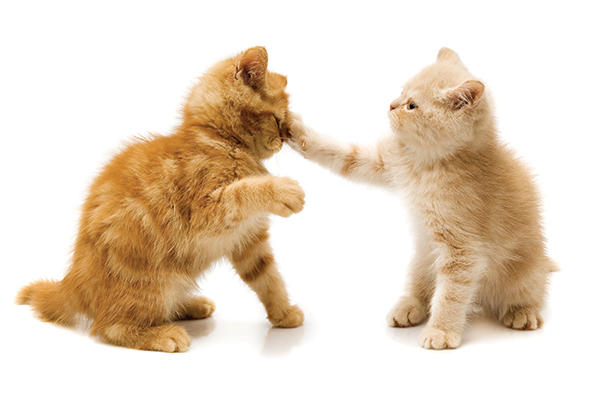 Rita Reimers’ Cat Behavior Coaching has helped many cat owners better understand their feline friends. 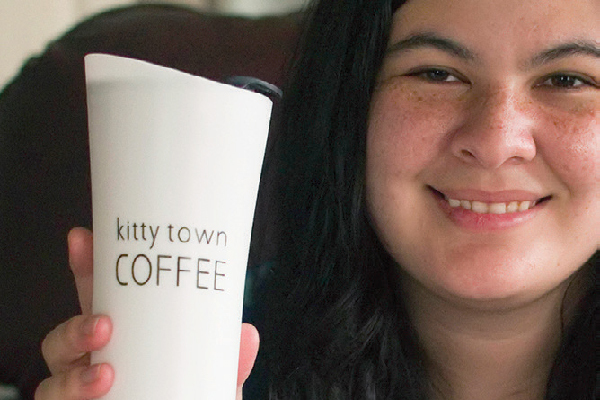 Visit RitaReimers.com to read her cat behavior blog or to book a cat behavior coaching session. Rita is also CEO/owner of JustForCatsPetSitting.com. Connect with her on Facebook and on Twitter at @theCatAnalyst.